Workabout Pro4 contains an integrated 802.11a/b/g/n radio module. 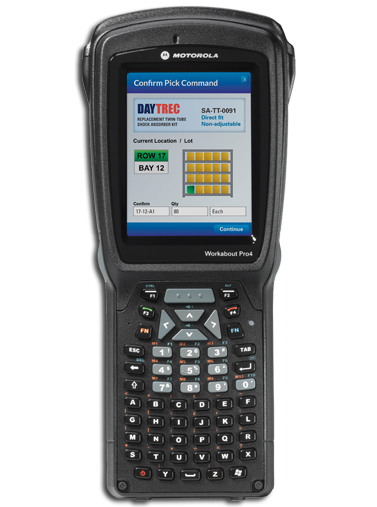 The Fusion Wireless Companion software is used to configure the radio for one or more wireless network profiles. Each profile specifies the security parameters used to connect to a particular WLAN as identified by its Extended Service Set Identification (ESSID). The Fusion Wireless Companion software also allows the operator to control which profile out of a set of profiles is used to connect. Follow the steps in this section to help configure the radio in your unit. The trigger back cover kit, model number WA9301, provides a special back cover that incorporates a scanner interface board and a switch; and triggers the SE1524ER long range laser, model number WA9022. WA9301 is required for WA9022 to function (with or without a pistol grip). This kit is also compatible with the Flush Mount Pistol Grip, model number WA6103.